"Published with the authorization of Microsoft Corporation"--Title page verso. 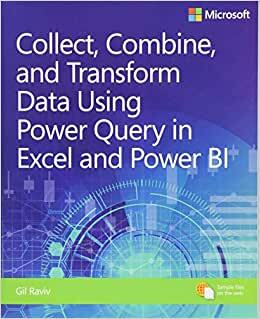 Start reading Collect, Combine, and Transform Data Using Power Query in... on your Kindle in under a minute. In his blog, DataChant.com, Gil has been chanting about Power BI and Power Query since he moved to his new home in the Chicago area in early 2016. As a Group Manager in Avanade’s Analytics Practice, Gil is helping Fortune 500 clients create modern self-service analytics capability and solutions by leveraging Power BI and Azure. I do not write reviews but in this case I'm making an exception. I have spent a good portion of my holiday break absorbing the lessons from this material and applying them to my Power BI models. I hadn't intended to spend so much of my vacation working the exercises but I found that each chapter explored a new idea and each left me wanting to know more. I would put the book down for a couple hours but between all the food and family I kept escaping to my quiet place to 'check' the next chapter. There is no coal in this book. On New Years evening I tried to open it again but got dirty looks from my sweetie. But honey, I explained, this is the champagne that turns my ugly work days into gold. She squeezed my hand (the one with the mouse in it), looked deep into my eyes and told me it's time to Collect, Combine, and Transform. Power Query is a great tool, but there’s so much to learn! How do you transform data while avoiding pitfalls? You could learn the hard way, like I did. I read other books, blogs, and watched videos. I also used Microsoft help docs. I love how this book empowers readers. The book teaches in Excel 2016 and Power BI, but the skills can be used in other Microsoft tools. Power Query is in SSAS Tabular as well as in Dataflows. It is also available in Excel 2010 and 2013. This is a complete guide to Power Query. Gil orders the book along key goals. For example, basic data prep, preserving context, and collaboration. This order not only streamlines learning, but it also teaches key concepts. The book begins with the user interface. From there, it leads into editing formulas. It also deftly supports best practices for data models. Only after this base does it introduce M code. And from there, it delves into pitfalls, text analysis, and social media. However, this book is not only for the novice. It’s filled with all kinds of gold for the adept. In the first half of the book, I learned at least five cool things. And even if you know plenty, it is always great to get a high level view and fill in the gaps. For me, it is one of the essential books for Microsoft self-help data tools. What this book is not. It's not an intro to Excel or Power BI. This book will not teach you DAX or data modeling. For that, I recommend Power Pivot and Power BI: The Excel User's Guide to DAX, Power Query, Power BI & Power Pivot in Excel. In addition, there are a number of techniques that I use which are not covered in the book. For that, I read blogs. At some point, Gil or someone may write a definitive guide to Power Query. So, I’m looking forward to improving my grasp of the basics. And I’m also eager to learn even more. I’m glad to have this book on my desk even if my colleagues want to borrow it now and then. Where was this book last year when I really needed it? Oh yeah, it didn't exist yet! This terrific book has given my Power Query fumblings a new direction and confidence. Although I had been using PQ for about a year, this book has given me a quantum boost forward in understanding how it works. In particular it has helped me solve a knotty challenge in connecting to a data source on SharePoint. It provides example files and exercises, which I have not worked through yet, but I can follow along in the text. I am recommending it to every power Excel user I know. Anyone who has to pull in lots of data, or inconsistent data, or dirty data will appreciate Power Query. I pledge to always use the power of Power Query for good, not evil. And this book will help you unleash that formidable power! 5.0 out of 5 starsFor anyone that is looking to stop the monataneous tasks of cleaning their data, get this book! As someone that does not have a database background my mantra was “just get the data into Excel and I can fix it there!” I doubt I am alone out there on that one. So, a lot of my job was basically doing the same thing over and over in order to produce some sort of final report. Not only is that incredibly boring but that boredom often leads to errors. A report that is built on errors is at best useless and at worst people take action on that report, and that is recipe for some “interesting” discussions down the road. Discussion I’d much rather not have. So why not build something once and then use that over and over, automatically? That is exactly what Power Query is meant to do. When first encountering the Power Query it seems close to excel (more like excel adjacent) but for someone who is more or less an excel expert, the differences become quickly apparent. Differences that at first can be intimidating. But the way Gil start slow and ramps up to more advanced topic makes it is no longer intimidating. Power Query goes from intimidating to “guess this is ok” to “oh, I see how this can work” to “this is awesome!” to “I wonder if I could do xyz?”. The files that come with the book will always be there for your reference too. I think most would be best served to do active learning with this book. Reading it in bed or wherever is fine, but I’d go back and go step by step and actually do it. It’s like learning to swim. You can read every book on the topic, but till you are in the water you will not actually learn. Also, if you are venturing into the world of DAX, using Power Query to transform your data makes the DAX so much easier to write. And with these streamlined DAX formulas, they are faster, prone to less errors, and much easier to troubleshoot when errors to appear. With that being said, Power Query (and the M language) does have its challenges. But these challenges are what makes it fun. Much like a lot of things in life you get out of it what you put in. I have no doubt that just the first few chapters will transform (no pun intended...) your day to day tasks. I also have no doubt that once you get done with those first few chapters, you won’t want to stop. I learned something new in almost every chapter. In addition, Gil Raviv the author, emails Bonus exercises to expand your skill. He responds to questions pretty quick. The book Q&A site has related answers you can quickly find when you have questions. His blog has some interesting Power Query and Power BI topics.